Again with a focus on group work, this threshold from dreaming to planning, analogous to the transition from forming to storming, is crossed by gaining more information about each other and mapping our characters. We also read again the dreams gathered in the dream circle to consolidate our shared vision. The planning stage is the threshold between dreaming and doing, and involves understanding the “possibility in context” and “thinking globally”. 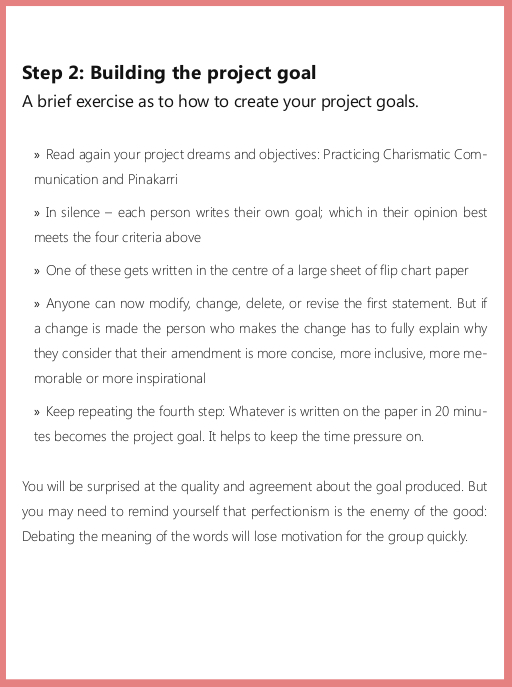 doing – testing and pilot projects. In this mapping process, we gained insight into how we work as individuals, gained a picture of our characteristics as a group, our patterns, strengths and weaknesses and how this might influence our design process. It was done as an intuitive and physical process, simply walking along the line of individual, environment, theory and practice from the centre and stopping where you felt comfortable. 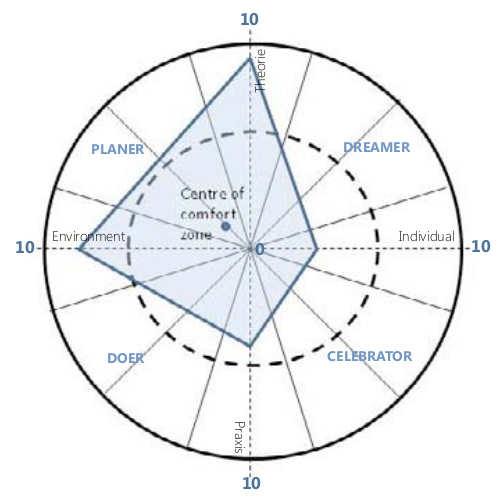 I measured myself to be pretty much in the centre with theory and practice 8, environment 7, individual 9. 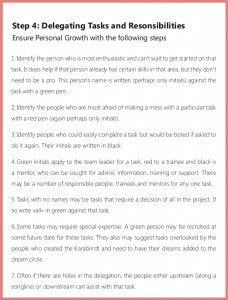 This was also useful as a reflective/learning exercise and could be developed further in that sense, for individual and group development. We read the herb garden dream circle notes in the past tense as a story as if the project had happened. A playful way to reconnect to the project, consolidate the vision and be inspired. The generative question here is: what is needed for these dreams to be realised? 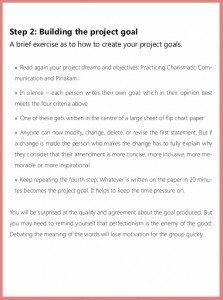 The answers provide us with strategies to meet multiple elements of the project. 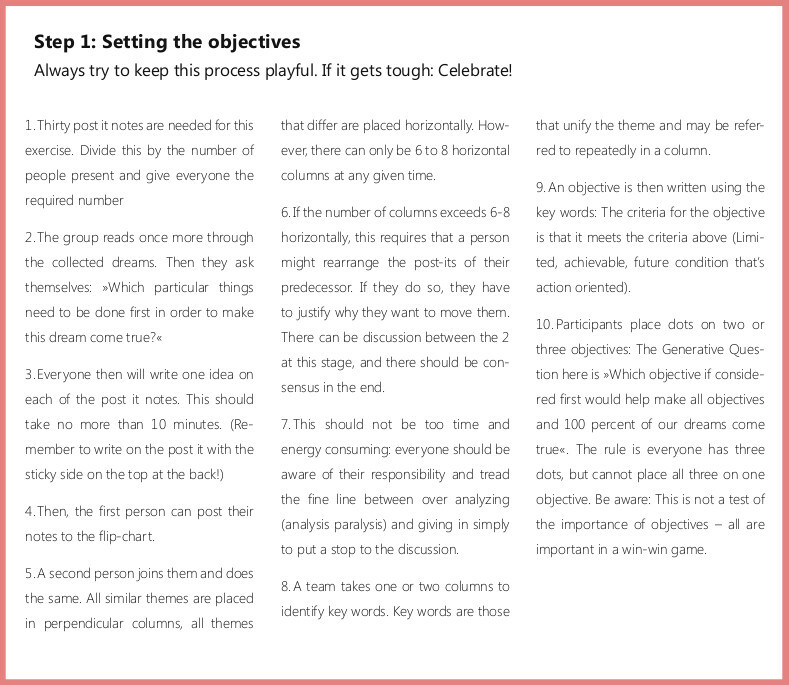 Again this was a collaboration and the objectives were cocreated. 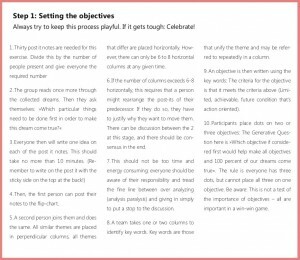 We then prioritised the objectives by each having three dots and putting them on the objectives in answer to the question: which objectives would make all our objectives and dreams come true? Our results: creation of a group and creation of a network. Establish a network of stakeholders to create a herb garden project. 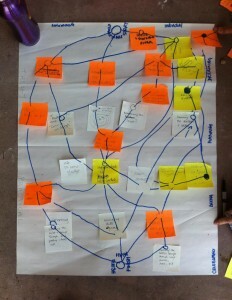 This was a creative process, with room for new ideas to be added as we went along. It was interesting to see how the process easily absorbed the nature of the initial intention and developed it. This was not a project with a specific site in mind or even a fully formed scope. The resulting design allowed for more dreaming and planning to develop the project, and also upheld the core intentions of studying herbs and working collaboratively. In the centre of the karabirrdt was the decision regarding the location and scope of the project and then beneath that the implementation. When these thresholds were reached, you would start the Dragon Dreaming process again, with celebration to dreaming, planning, then implementation. 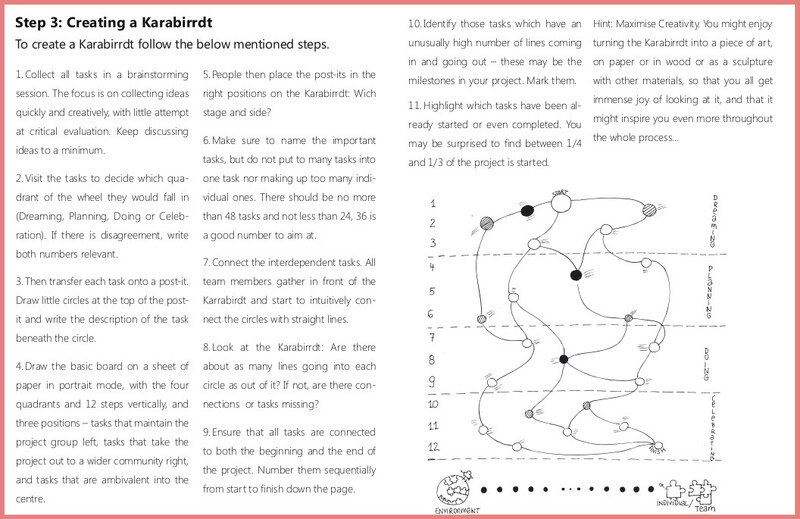 The emphasis was placed on looking at the karabirrdt as a picture, making sure there was an even balance of tasks at all stages, an even balance on both sides (tasks for the team and tasks for the ‘environment’), a balance of the connections between the projects, that no task was unconnected and identifying which were key tasks. 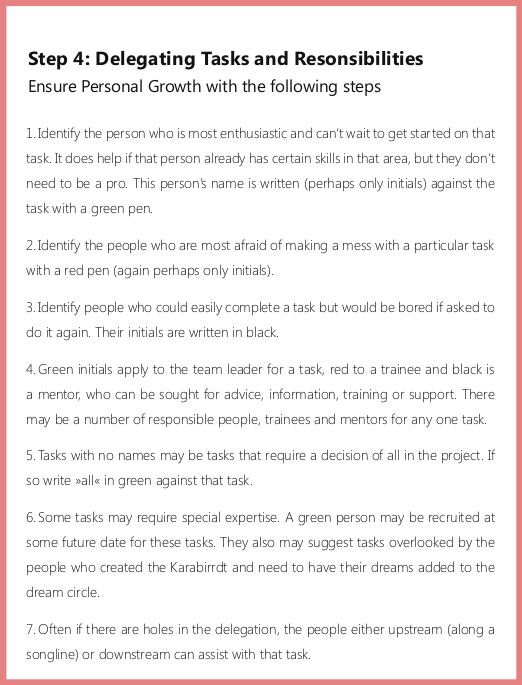 It was great to see that project was already underway by noting that some of the tasks were at least partially done (see the dots on each task). consulting stakeholders – connecting with friends and local people interested in herbs, visiting herb gardens locally and further afield. The nature of the herb garden project – a dream or vision, rather than a concrete site for development – dictated the design meeting the permaculture principle of working with nature. Once a site is located, I think all stages would have very different tasks and could be ‘permaculture’, if the Dragon Dreaming ethic of service to the earth is met. The design process was enjoyable, adaptive, creative and collaborative. 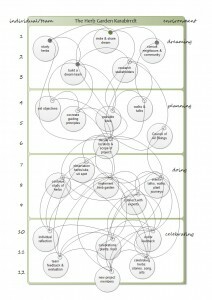 It worked smoothly and could definitely assimilate permaculture ethics and principles more explicitly if there was an awareness of them by the designers. There is however in the Dragon Dreaming process no explicit use of permaculture design. 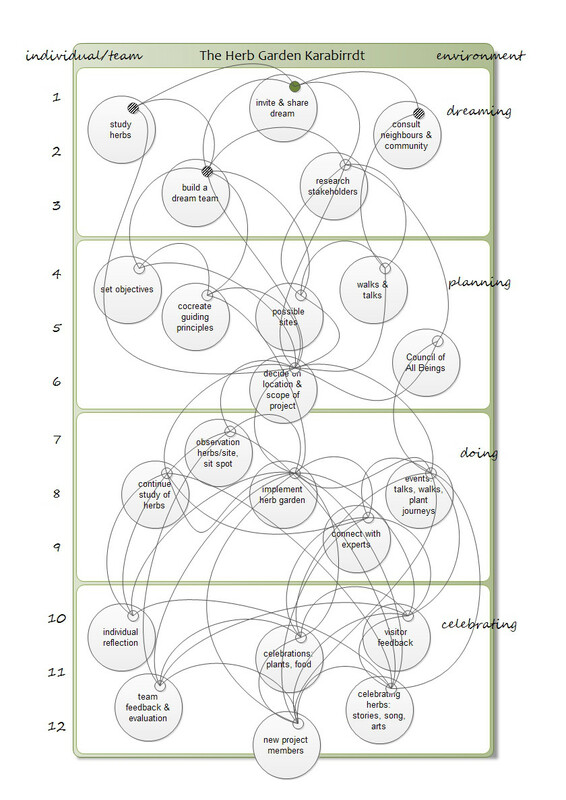 Permaculture design in the UK uses the SADIM design cycle with a great emphasis on the survey and analysis stages. In my experience of Dragon Dreaming, there was no explicit emphasis on the analysis phase. It may be that through the process of working collaboratively, the outcome is naturally more in tune with the earth and the people involved. 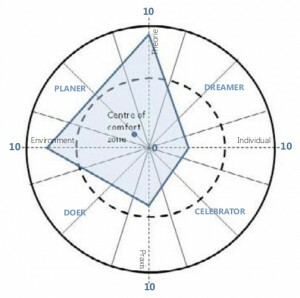 Interestingly, the founders of permaculture and probably many other permaculturalists do not use the SADIM design cycle, so using Dragon Dreaming might be an option as long as the permaculture ethics and principles, and key permaculture design tools, are incorporated. Key is the environmental impact (earth care), which might easily be missed (although it is a key ethic of Dragon Dreaming). applying key permaculture principles to the options arising, including ecological impact, appropriate scale, energy cycling, edge effect.